Within this work's more than 200 A-Z entries, internationally recognized scholars summarize views of Muhammad from the earliest editors of the Qu'ran to contemporary Muslim theologians. This detailed resource explores the traditions, ceremonies, and beliefs of Islam as they have spread worldwide, and examines Muhammad's role in other religious traditions as well as the secular world. 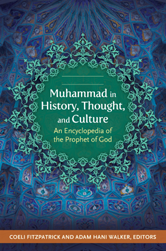 "Muhammad in History, Thought, and Culture: An Encyclopedia of the Prophet of God" distills 14 centuries of thinking about Muhammad, fully capturing his enduring legacy.